α-actinin is an actin-binding protein  and component of the actin crosslinking functional modules; it lacks G-actin binding activity and lacks actin initiation/nucleation activity . 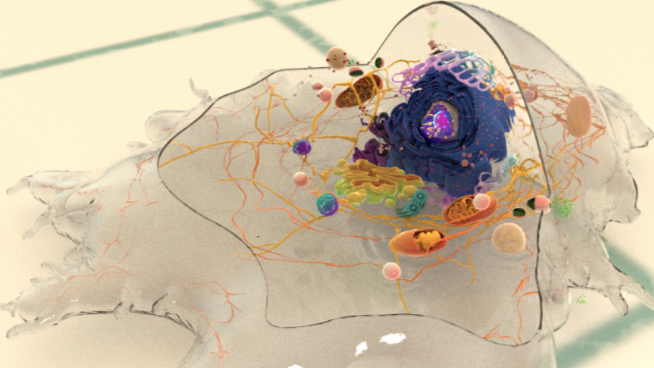 α-actinin is an important organizer of the cytoskeleton that belongs to the spectrin superfamily (which includes spectrin, dystrophin, and related homologues). α-actinin is present in a number of diverse organisms including protists, invertebrates, and birds; mammals have at least four α-actinin genes that together account for 6 different α-actinin proteins whose expression profile is tissue specific (reviewed in ). This schematic diagram illustrates the molecular organization of α-actinin (reviewed in [PMID: 18488141]) and provides examples for how α-actinin is represented in figures throughout this resource. Relevant domains/regions that are believed to be important for actin binding and protein-protein interactions are highlighted (actin binding domain (ABD) [PMID:3733725], β-integrin [PMID:2116421, 15721583], α-catenin [PMID:9152027] and vinculin [PMID:15988023, 8037676]). All α-actinin proteins have a flexible amino-terminal F-actin binding domain (ABD, composed from two calponin homology [CH] domains), a central rod containing spectrin repeats (S or SR), and a carboxy-terminal calmodulin (CaM)-like domain composed of EF-hand calcium-binding motifs (see figure below). 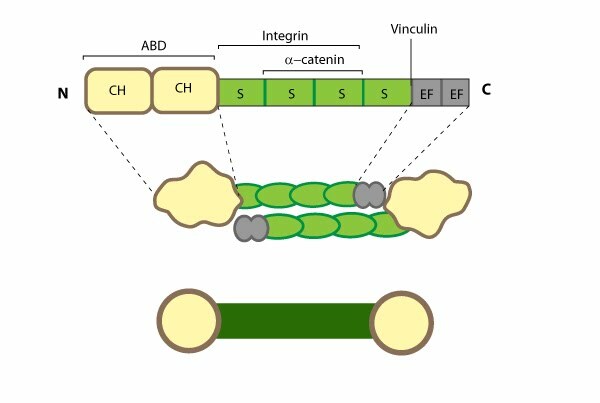 Calcium inhibits the association of non-muscle α-actinin isoforms with F-actin  whereas binding of the muscle isoforms is insensitive to calcium . The basic organization of the ABDs is quite similar in other members of the α-actinin superfamily such as filamin, fimbrin, and parvin . α-actinin binds F-actin  and other molecules such as phophatidylinositol-bisphosphate (PIP2) , cell adhesion proteins (e.g. *integrins ) and signaling enzymes (e.g. PI3K ). It also interacts with *vinculin through the 4th S repeat  and this interaction acts as a regulatory switch in adherens junctions . Intramolecular contacts that sterically prevent α-actinin from interacting with actin filaments and integrins are relieved by PIP2 binding to the ABD  and this regulates α-actinin dynamics . Dimerization of α-actinin via the rod domain is also essential for crosslinking actin  and for binding to other proteins (e.g. *zyxin) , therefore, a dimer has functional domains at both ends ; this organization allows them to bind to adjacent actin filaments . The smaller size of the α-actinin dimer combined with flexible hinges at the ABDs, makes α-actinin a versatile actin crosslinker capable of forming variable orientations and angles between actin filaments, as well as forming tighter bridges between filaments (such as those found in actin bundles) (reviewed in ). α-actinin primarily influences the cohesiveness and mechanics of the cytoskeleton by cross-linking actin filaments and other cytoskeleton components to create a scaffold that imparts stability and forms a bridge between the cytoskeleton and signaling pathways. α-actinin interacts with numerous (~30) components in the cell (reviewed in ) and certain α-actinin isoforms (and related proteins) appear to be active in the nucleus (reviewed in ). α-actinin is mainly found at the leading edge of migrating cells and it is an important component of adhesion modules . Dendritic spines are also rich in α-actinin and it appears to play a role in neuritic outgrowth . Lastly, α-actinin is believed to be the primary crosslinking protein in stress fibers  and it plays a major role in the maturation of focal adhesions . Localization of α-actinin to the plasma membrane is controlled by a number of interactions with membrane lipids and transmembrane receptors (reviewed in ). For example, binding of PIP2 at the plasma membrane causes a conformational change in the CaM-like domain that subsequently increases α-actinin’s affinity for actin and its ability to interact with other cytoskeletal components (e.g. titin ) (reviewed in ).